Water Hyssop, photographed at Wakodahatchee Wetlands, Delray Beach, Palm Beach County, in April 2018. To much of the world, this little guy is a big deal. 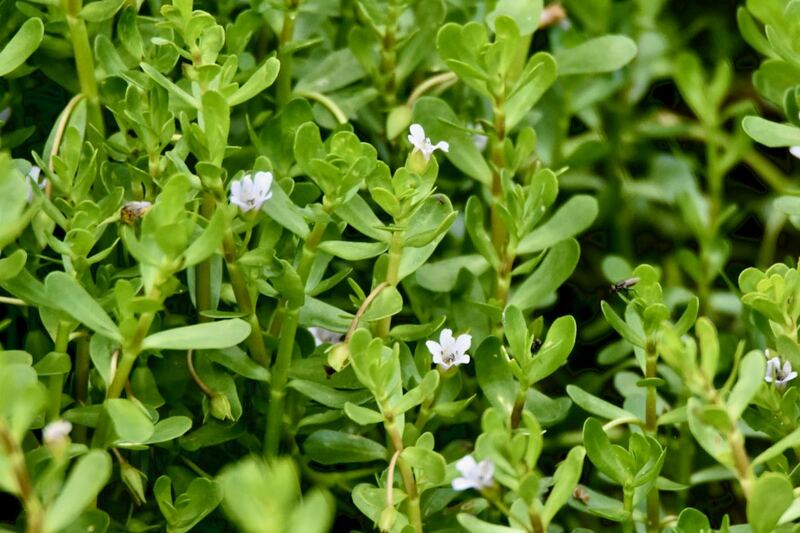 It's water hyssop, Bocapa monnieri, otherwise known simply as bacopa. For centuries, it's been a staple of Aruveda, or traditional Indian medicine, used to treat a variety of conditions, many neurological. It's still widely used. 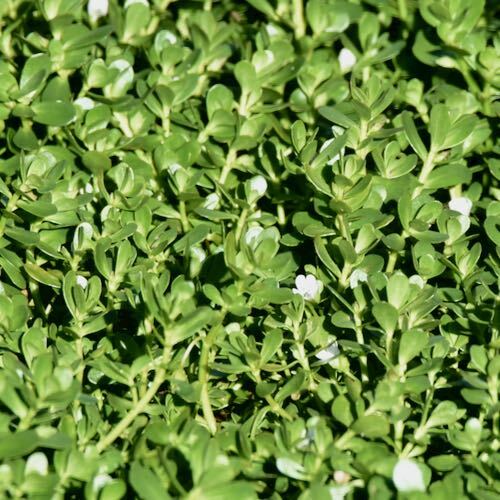 Google bacopa and you'll come across a lengthy list of retailers offering bacopa extracts touted toimprove your brain function and even extend your life. It is a Florida native found throughout most of the state, and as far north as Maryland. Its range extends along the Atlantic and Gulf coasts to Texas and Oklahoma and west as far as Arizona and California. Water hyssop is also native to Mexico, Central America and South America, but it's also found in parts of Africa and southern Asia, including, of course, India. Water hyssop, as you might guess from the name, is a water-loving plant, requiring moist to wet soils. It has little tolerance for drought. It's typically found along the edges of marshes, lakes and ponds, places that are wet but not necessarily inundated all the time. It will grow in fresh or brackish water. It is short, going perhaps six inches tall, but it will form large, dense, creeping mats. The leaves are thick, shiny green, eliptical in shape, sort of like those small wooden spoons that come with single-serving containers of ice cream or flavored ice. The flowers are bell-shaped, have five petals, are blue to pinkish-white and bloom all year. The flowers are borne singly at the end of a stock that forms at the leaf axil, the joint where the leaf and stem meet (see photo at left). Water hyssop is a larval host plant for the white peacock butterfly. 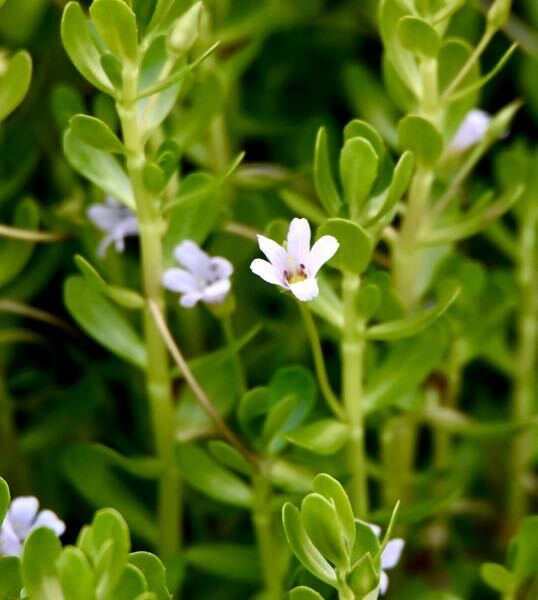 As we noted above, it has a prominent place in traditional medicine, used to improve memory, reduce anxiety and treat attention deficient hyperactivity disorder and to improve thyroid function. It's also been used to treat Alzheimer's patients and is said to have anti-oxidant properties. There is some scientific evidence that water hyssop does improve on memory and cognitive functions in elderly patients (average age of the group studied: 73) with little in the way of harmful side effects. There are also studies showing benefits for young children as well. But WebMD notes that studies as a whole are a mixed bag, some showing benefits, others not. And people with certain conditions (pregnancy, slow heart rate, emphysema, thyroid problems) probably should avoid it altogether. Water hyssop is cultivated, used as a ground cover around ponds and lakes and in restorations. It's used in aquariums. Water hyssop is also known as herb of grace, coastal water hyssop, brahmi, Indian pennywort and a heck of a lot more. Depending on the source, it is classified as a member of Scrophulariaceae, the snapdragon family, or Plantaginacease, the plantain family. It has a cousin, lemon bacopa, that is a Florida native.